It’s no secret that I actively encourage you all the backpack Australia – it’s the country I headed to for my first long term solo trip and over the last 8 years it’s the country where I’ve clocked up the most amount of time. And after a year long working holiday visa, 1 year sponsorship, 3 trips up the East Coast, 1 campervan trip up the West Coast and more tourist visas than I can remember its fair to say Australia is the country I know most about travelling around! So if you’re busy planning your first trip to backpack Australia here’s 20 things I think you should know to help make everything much easier, enjoyable and so you don’t have any nasty surprises! 2. Goon – Your New Best Friend And Worst Enemy! 11. …And Don’t Forget To Claim Your Tax Back And Superannuation Back! 13. It Does Actually Get Cold! And then of course there’s the outback and Western Australia. Bottom line is don’t expect to bounce between destinations in a few hours so be realistic about what you can fit into your time frame and where you can visit on your trip. There’s nothing more core to earning your stripes when you backpack Australia than drinking goon. In a nutshell it’s super cheap, boxed wine and you can pick up a 5 litre box for around $20. Compare that with $20 for a 6 pack of beer and it’s easy to see why you’ll get sucked into pre drinks of goon before a night out! Sure it’ll get you where you want to go for cheap – but be prepared for trippy dreams, rotten guts and extreme hangovers! …it wont stop you drinking it though! Although Greyhound is the most popular option to travel around Australia (their hop on, hop off passes and new WHIMit passes cover most routes) check out the Premier Bus Passes which are slightly cheaper and cover the same routes. Just keep in mind the buses aren’t quite as new and you’re limited to only one departure per day. 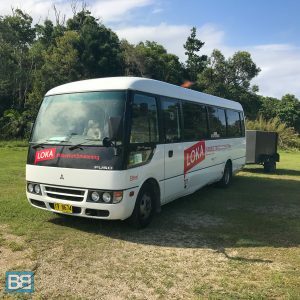 Also worth checking out is the Stray Australia hop on, hop off bus too – it’s more pricey than the other options but also semi guided with some amazing discounts on route too. If you’re planning to backpack Australia the chances are your route is mainly focusing on the East Coast, from Melbourne or Sydney up to Cairns. But if you have the time and budget make sure you get across to Western Australia is you have the chance – it’s absolutely incredible! Dont expect the bustling party scene of the East Coast in WA though, you’ll be getting into the real outback, where the natural beauty of Australia really comes across. Spots like the Pinnacles, Shell Beach, Coral Bay, Exmouth and Shark Bay are absolutely stunning to explore. If you have a crew hire a cameraman for the ultimate Australia road trip, if not booking a tour package is the best way to cover this slice of Oz. 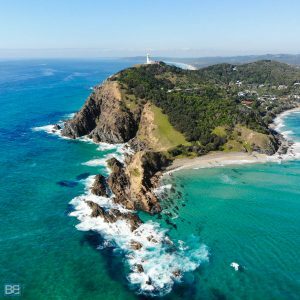 If you backpack Australia you HAVE to visit Byron Bay, so make sure you pencil in more than enough time for this barefoot hippie town. Having lived, worked and travelled all across Australia this is easily my favourite place to chill, explore and surf. In fact it’s one of my favourite backpacker towns in the entire world! With heaps of gorgeous beaches to explore, activities like skydiving, scuba diving, learning to surf and dolphin kayaking to tick of the bucket list you’ll want an absolute minimum of 3 nights here. But honestly I’d say 5 nights or longer is ideal. Either way you’ll be back again, I’m, sure of it! But if you really want to find the hidden gem of the East Coast it has to be the sleepy town of Yamba – a few hours south of Byron Bay. Many locals describe it as what Byron was like 25 year ago – with empty beaches, quite vibes and some incredible surf. 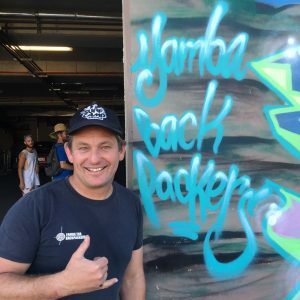 It’s all about the slower pace of life here and beach time so pack your board and sunscreen and stay with Shane and Justin at YHA Yamba who’ll welcome you into their extended backpacker family. If there’s two tours that you can’t miss out on on when you backpack Australia then it has to be Fraser Island and the Whitsundays. Fraser Island is the largest sand island in the world and the overnight options even give you the chance to cruise down the beach in a 4×4 and tackle the sand tracks through the islands rainforest to spots like the stunning Lake Mackenzie. Personally I’d always suggest the 3 day/2 night options as they give you more time to explore (obviously) and take in more stops across the island too. It’s well worth it! The Whitsundays on the other hand is all about the ocean and visiting one of the most famous beaches in the world – Whitehaven Beach. The overnight sailing option give you the chance to hit up spots like Hill Inlet (for that Instagram perfect view), snorkel some of the colourful reefs (fingers crossed you’ll find Nemo and some turtles!) and of course fall asleep on the boat to the sound of the waves. Both trips are awesome fun – personally though Fraser Island is my favourite of the two! Click here for an awesome rundown of the best Fraser Island tours and here for the best Whitsunday tours to find the perfect match for your budget and style. 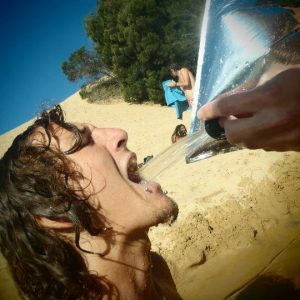 With some many people backpacking around Oz there’s plenty of options to choose from when it comes to hostels. But do your research as hostels in Australia vary A LOT and what might seem like a bargain may well turn out to be your worst nightmare! A lot of the time you really do get what you pay for so I’d suggest avoiding the cheapest option unless you really have to! That being said though Australia has some awesome hostels, some with pumping bars, others offering heaps of free activities and a few with absolutely incredible locations. Let me know in the comments if you have any awesome ones I should add to the list and check out. Simply put, Australia is far from the cheapest place you’ll ever backpack – in fact it’s renowned for being one of the most expensive. But as long as you’re prepared for that and do your research you’ll be fine. Also keep in mind that your most basic daily spend (hostels and food) aren’t massive – so don’t be afraid to extend your stay to give you some downtime and spread out your big fixed costs. On the flip side to the cost of travelling Australia is the amount you can actually earn whilst you’re there! Australia has one of the easiest working holiday visas to apply for and getting a job down under can pump up your bank balance pretty nicely if you’re organised about it! Even basic jobs such as bartending and waitressing command a wage of around $20-25 per hour so if you put int he graft and are careful with your spending it’s easy to walk away with a big chunk of change to pay for your East Coast trip or onward adventure! If you do go the Australian working holiday visa route make sure you remember to claim back your tax and super annuation when you leave! Claiming your tax back is super simply and can be done in under 10 minutes online – and with an average refund of around $3,000AUD you’d be stupid not to! Super annuation is the Aussie equivalent of a pension fund and is also something you should make sure you claim back! Again this can be done online so you have nothing to loose and potentially a lot of extra cash to gain. If you’re not keen on the working holiday visa idea or staying for a shorter trip then you’ll be happy to hear that for most countries getting a tourist visa for Australia is relatively simple and usually free! The e-visa can be completed online in about 15 minutes and in usually allows you stay up to 3 months at a time, multiple times for a 12 month period. Click here to check out the official Australian immigration site to check the current requirements and processing times. Despite what you might think Australia can in fact get cold! This is especially true for southern spots like Adelaide, Melbourne, Tasmania and even Sydney in the winter period which runs May > September. In fact there are even ski fields outside of Melbourne, I bet you didn’t expect that! So keep this in mind when planning your trip to Australia. If it’s a short trip you cant do much to avoid it if your travel dates aren’t flexible, but over a longer period it’s good to plan your route around this to make the most of the weather. Although the Greyhound bus is probably the most convenient and popular way to travel around Australia the most fun has to be with a campervan. So grab a crew and plan your perfect road trip! 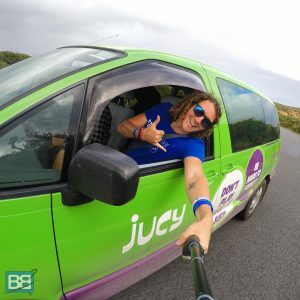 There are plenty of campervan suppliers to choose from as well – including Jucy, Camperman, Travellers Autobarn, Hippie and Britz – with a huge range of camper vans for all budgets and styles. So whether you want something basic for two people or a 5 person luxury campervan complete with shower and toilet you’ll be able to find it. Prices vary a lot depending on the type of campervan, route, length of hire and season so my advice is to lock it in as far in advance as you can for the best price. One word of warning though – I’d avoid the Wicked Campervans, they dont have the best reputation for safety or quality and many of their out their spray jobs are actually banned in some National Parks! Internal flights in Australia can actually make your trip quicker and way more comfortable. The obvious example of this would be heading from the East to the West Coast or even inland for the Red Centre – again keep in mind Australia is big, so travel times can be significantly cut with a flight. The less obvious (but more useful!) example would be for travel between Sydney and Melbourne and also Sydney to Byron Bay. Both trips via bus are an overnight trip (nearly 18 hours worth) and on a Greyhound Bus Pass they both add an extra $100 to your pass – so Cairns > Byron is just over $300, Cairns > Sydney is $445 and Cairns > Melbourne is $545. Now if you’re on a tight schedule loosing that amount of time isn’t great. 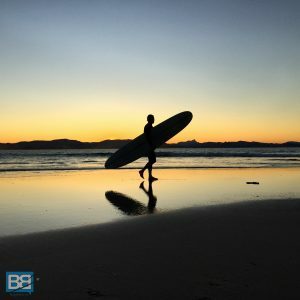 And when you put into the mix that you can get flights from Byron Bay (Ballina Airport) > Sydney for around $50 and the same from Sydney to Melbourne you’ll quickly see why flying is pretty appealing. Your 18 hour Sydney to Byron Bay overnight bus becomes a 2 hour flight. Even when you factor in the cost of airport transfers and travel time ($20 to Sydney airport, $20 to Byron Bay, 3 hours including check in time in Sydney, 45 mins to get to Byron) they work out great value in both time and money. So be smart and weigh up all the options when planning your itinerary! Everyone loves saving money and in a country that’s expensive to travel it’s even more important to make your money go as far as possible. So if you want to get more bang for your buck in Australia the best way to go is a discounted package deal. On a shorter itinerary packaging together everything you need on a fixed dated basis – including hostels, accommodation and tours) will save you hundreds of dollars compared to booking everything individually yourself. Why? Well travel agencies have a commission rate of anything from 15-25% per product, so if you bundle together what you need they can offer you some awesome discounts by taking it off their commission! Even if you want more flexibility this is the way to go as they can also do tour only packages and booked them open dated – meaning you lock in your dates once you know when you want to do the trip. 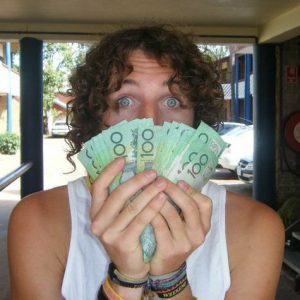 Check out the best Australia package deals here or even get a custom Australia package deal using this form with the crew of RTW Backpackers. If you think you’ll be bored in Australia think again – there are HEAPS of amazing things to see and do all across the country. From learning to surf in Australia to visiting Ayres Rock, road tripping the Great Ocean Road or even skydiving…you’re not going to be short of things to fill your trip with! Check out 40 of the best places to visit in Australia here with heaps of things to see and do. If you love scuba diving then the chances are you have the Great Barrier Reef on your to do list – and rightly so, it’s one of the natural wonders of the world. However in all honesty it’s not the best diving I’ve ever done and there are some other incredible dive sites all across Australia. Most also offer intro dives too, so if you want to give scuba diving a go without paying for a full dive course it’s a great way to try it out. 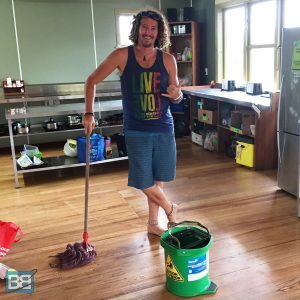 One of the biggest costs during your trip in Australia is accommodation – but luckily many hostels offer the opportunity to work for accom, trading a few hours of work (washing dishes, changing bed sheets, mopping floors etc) for a free nights stay. So I you find a place or hostel you love ask at reception and see what they offer. It’s quite in demand though so be patient and honestly just make yourself known and keep asking! 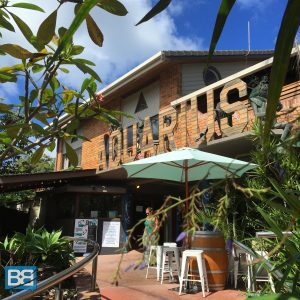 It was one of the most fun experiences I did in Australia and allowed me to live in Byron Bay for nearly 8 months spending very little as the hostel I did work for accom at (Aquarius Backpackers) also gave you a free evening meal, weekly bar tab and discounts on trips and tours too! If I’m being totally upfront about this it is also possible to do work for accommodation at some hostels on a tourist visa too as many places wont even question if you have a work visa. However be warned this is technically illegal so do it at your own risk! Aussie and BBQs go together like Jack and Coke, so I’m sure you’re expecting to chuck another shrimp on the barbie (FYI Aussie NEVER say that so dont get your hopes up!) on more than a few occasions. So you’ll be stoked to discover that there are free to use BBQs on most beaches around the country, usually with epic views too. All you need to do is push the button to get it started and then they switch off automatically – so grab a cold beer and start cooking. Be respectful though and leave them clean and tidy for the next person – my top tip is to put a layer of tin foil on top of them before cooking for a quick clean up and minimal mess! So if you’re planning to backpack Australia anytime soon there’s 20 things that should help make your life a little easier and hopefully take out some nasty surprises too! Don’t forget to check out all my Australia travel tips here for heaps more reviews and advice from all over this stunning country! And of course if you need any help with your trip drop me an email and I’d be stoked to help out! Any advice you’d add to the list? Thanks For guiding us to travel to Australia. This information is very helpful to other travelers to back up their budget to visiting Australia. I love the video that came along with this post. Australia is such a wild yet an exotic place to travel to. There’s more than what meets the eye in that country and you will never run out of things to do. So much going on there – every time I go back a new adventure awaits!